Lothbrocus and his sons Ivar and Ubba. 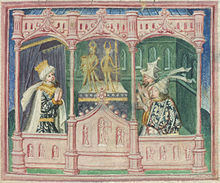 15th century miniature in Harley MS 2278, folio 39r. Ragnar Lodbrok or Lothbrok (Old Norse: Ragnarr Loðbrók, "Ragnar shaggy breeches", contemporary Norse: Ragnar Loðbrók) was a historically dubious Norse Viking hero and legendary king of Denmark and Sweden, known from Viking Age Old Norse poetry and sagas. According to that traditional literature, Ragnar distinguished himself by many raids against Francia and Anglo-Saxon England during the 9th century. There is no evidence that he existed under this name and outside of the mythology associated with him. According to the Tale of Ragnar Lodbrok, Ragnar was the son of the Swedish king Sigurd Ring. According to the Tale of Ragnar Lodbrok, Ragnar was the son of the Swedish king Sigurd Ring. The Hervarar saga tells that when Valdar died, his son Randver became the king of Sweden, while Harald Wartooth became the king of Denmark. Then Harald conquered all of his grandfather Ivar Vidfamne's territory. After Randver's death, his son Sigurd Hring became the king of Sweden, presumably as the subking of Harald. Sigurd Hring and Harald fought the Battle of the Brávellir (Bråvalla) on the plains of Östergötland, where Harald and many of his men died. Sigurd ruled Sweden and Denmark from about 770 until his death in about 804. He was succeeded by his son Ragnar Lodbrok. Harald Wartooth's son Eysteinn Beli ruled Sweden as Ragnar's viceroy until he was killed by the sons of Ragnar. The Tale of Ragnar's Sons tells that the Great Heathen Army that invaded England in 865 was led by the sons of Ragnar Lodbrok, to wreak revenge against King Ælla of Northumbria who had supposedly captured and executed Ragnar. The Siege of Paris and the Sack of Paris of 845 was the culmination of a Viking invasion of the kingdom of the West Franks. The Viking forces were led by a Norse chieftain named "Reginherus", or Ragnar. This Ragnar has often been tentatively identified with the legendary saga figure Ragnar Lodbrok but the accuracy of this is disputed by historians. Around 841, Ragnar had been awarded land in Turholt, Frisia, by Charles the Bald but he eventually lost the land as well as the favour of the King. Ragnar's Vikings raided Rouen on their way up the Seine in 845 and in response to the invasion, determined not to let the royal Abbey of Saint-Denis (near Paris) be destroyed, Charles assembled an army which he divided into two parts, one for each side of the river. Ragnar attacked and defeated one of the divisions of the smaller Frankish army, took 111 of their men as prisoners and hanged them on an island on the Seine to honour the Norse god Odin, as well as to incite terror in the remaining Frankish forces. 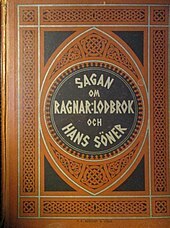 The saga as published by Norstedts in a large-size illustrated version (1880). The Great Heathen Army is said to have been led by the sons of Ragnar Lodbrok, to wreak revenge against King Ælla of Northumbria who had supposedly executed Ragnar in 865 by casting him into a pit full of snakes. The Great Heathen Army was organized and led by the brothers Ivar the Boneless, Ubba, Halfdan, Björn Ironside, Hvitserk, and Sigurd Snake-in-the-Eye. The first four are known historical figures. Ivar the Boneless was the leader of the Great Heathen Army from 865 to 870, but he disappears from English historical accounts after 870. The Anglo-Saxon chronicler Æthelweard records Ivar's death as 870. Halfdan Ragnarsson became the leader of the Great Heathen Army in about 870 and he led it in an invasion of Wessex. A great number of Viking warriors arrived from Scandinavia, as part of the Great Summer Army, led by King Bagsecg of Denmark, bolstering the ranks of Halfdan's army. According to the Anglo-Saxon Chronicle, the Danes battled the West Saxons nine times, including the Battle of Ashdown on 8 January 871, where Bagsecg was killed. Halfdan accepted a truce from the future Alfred the Great, newly crowned king of Wessex. Halfdan succeeded Bagsecg as King of most of Denmark (Jutland and Wendland) in about 871. Bjorn Ironside became King of Sweden and Uppsala in about 865, (the same year his father Ragnar is said to have died). Bjorn had two sons, Refil and Erik Björnsson. His son Erik became the next king of Sweden, and was succeeded in turn by Erik the son of Refil. 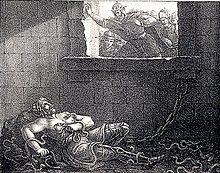 Sigurd Snake-in-the-eye became King of Zealand and the Danish Isles in about 871, and also succeeded his brother Halfdan as King of Denmark in about 877. 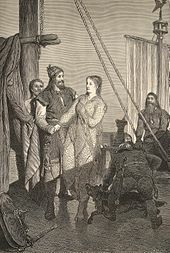 Ragnar receives Kráka (Aslaug), as imagined by August Malmström. Certain scholars in recent years have come to accept at least part of Ragnar's story as based on historical fact. Although his sons are historical figures, there is no evidence that Ragnar himself ever lived and he seems to be an amalgam of historical figures and literary invention. Attempts to link the legendary Ragnar with one or several of those men have failed because of the difficulty in reconciling the various accounts and their chronology. The tradition of a Viking hero named Ragnar (or similar) who wreaked havoc in mid-9th-century Europe and who fathered many famous sons is remarkably persistent and some aspects of it are covered by relatively reliable sources, such as the Anglo-Saxon Chronicle. History's popular 2013 TV series Vikings, Australian actor Travis Fimmel played the lead character of Ragnar Lothbrok for the first four seasons. Bernard Cornwell's novel The Last Kingdom and the BBC America's series of the same name opens with the invasion of the Great Heathen Army to avenge Ragnar's death. Printed as a Legend card in the 1994 Legends expansion set for Magic: The Gathering. ^ Magnusson 2008, p. 106. ^ Harrison 1993, p. 16. ^ a b Kohn 2006, p. 588. ^ a b c Jones 2001, p. 212. ^ Sprague 2007, p. 225. ^ Sawyer 2001, p. 40. ^ Duckett 1988, p. 181. ^ Karasavvas, Theodoros. "Ragnar Lothbrok: The Ferocious Viking Hero that Became a Myth". Ancient Origins. Retrieved 2018-04-28. ^ a b c Holman 2003, p. 220. ^ Davidson 1980, p. 277. ^ "'Last Kingdom' Stars: Where Have You Seen Them Before? | BBC America". BBC America. Cite error: A list-defined reference named "Saxo9" is not used in the content (see the help page). Saxo Grammaticus (1980) . Davidson, Hilda Roderick Ellis (ed.). Gesta Danorum [Saxo Grammaticus: The history of the Danes: books I–IX]. 1 & 2. Translated by Peter Fisher. Cambridge: D. S. Brewer. Chapter introduction commentaries. ISBN 978-0-85991-502-1. Harrison, Mark (1993). "Viking Hersir 793–1066 AD". Osprey Publishing. ISBN 978-1-85532-318-6. Kohn, George C. (2006). Dictionary of Wars. ISBN 978-1-4381-2916-7. McTurk, Rory (1991). Studies in Ragnars saga loðbrókar and Its Major Scandinavian Analogues. Medium Aevum Monographs. 15. Oxford. ISBN 0-907570-08-9.